Jeff Rice, creator of Carl Kolchak, passed away July 1 in Las Vegas at the age of 71. His novel about the character was somewhat unintentionally the basis for two TV movies and an ABC series. David Dawidziak reports in The Night Stalker Companion that the television movie rights to Rice’s 1970 unpublished novel was sold without his permission to ABC. Rice sued the network, which settled before the series aired, and gave creative credit on screen to Rice. The Kolchak: The Night Stalker TV series aired on ABC during the 1974–1975 season. 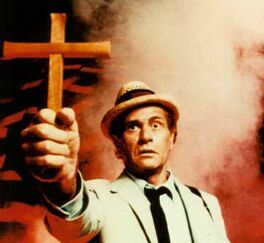 Played by Darren McGavin, Kolchak investigated mysterious crimes touching on the supernatural and the science fictional. The series was preceded by two movies for television, The Night Stalker (1972) and The Night Strangler (1973). This entry was posted in In Passing and tagged Jeff Rice, Kolchak by Mike Glyer. Bookmark the permalink. That McGavin picture looks like Detective Miller (Expanse) to my view. There was a thuddingly (and deservedly) unsuccessful attempt to remake the series a decade ago. I remember watching a Kolchak set in Seattle and investigated something in the Seattle underground city (which really exists). The fact they shot it (partially) in the real underground city made it stick in my mind. The Night Stalker was about an old time reporter in his fifties who thought he’d seen it all, and then everything changes. He is dynamic and is not afraid to speak truth to power. The unfortunate TV remake was about a guy in his late twenties who was boring, barely had a personality, and it was trying to reinvent the X-Files. It was not Carl Kolchak. I can’t imagine Jeff Rice was happy with it. Jeff was a very unhappy man. For a long time he lived in a Los Angeles neighborhood which he saw change around him until it became a high crime area. Initially he refused to move and give up his home. Apparently he finally gave in.